A spout of water goes over a head-high free fall near the top, then tumbles and winds down a series of shallow cascades toward the middle and bottom. The rock is colorful. This one really needs some good water flow to look good, and probably only becomes visible in winter when leaves are off the trees. Still, in these conditions, it's nice. From the intersection of US 276/64 and NC 280 in Brevard, NC, take US 276 west for 11.7 miles, past the Pink Beds Picnic Area. Turn right onto gravel Yellow Gap Rd., FS 1206. Go 1.3 miles to the Barnett Branch trail crossing (it is signed). There is a small parking pull-off - park here. 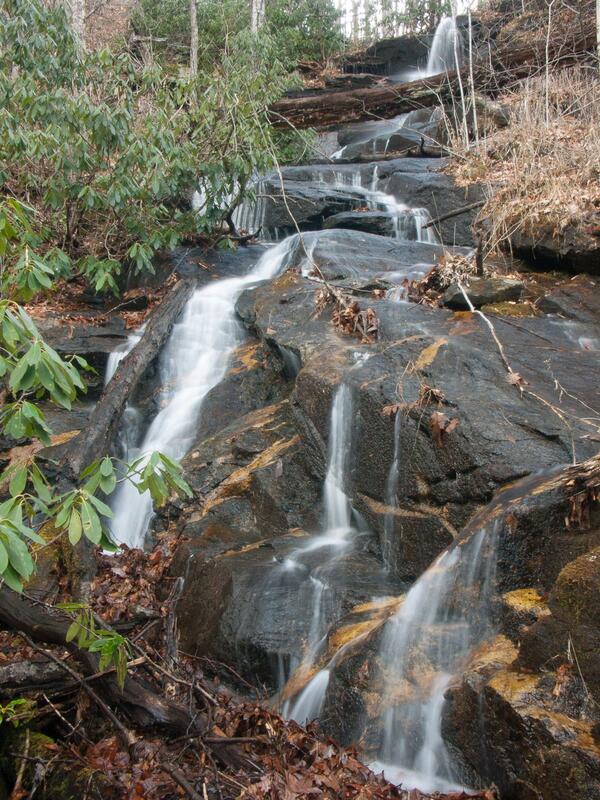 Take the blue-blazed Barnett Branch trail uphill (northwest) toward the Buck Spring trail for about 0.3 mi to the first waterfall, on the left, at a right-hand switchback. A short side path leads directly to the base of the falls. Continue up the trail about 0.2 mi to the second waterfall, also on the left. You'll go through a left-hand switchback, cross a sketchy log bridge near the top of the first falls, and then pass a very small water slide on the left before reaching the 2nd falls. It's a bit harder to get a close-up view of the second falls and it's not quite as scenic. Still, the little spout at the top makes it interesting and worth a look if you're in the area, the water is up, and the leaves off the trees.